For 2016, Chevrolet Colorado crew cabs get an optional diesel four-cylinder engine. The available MyLink touchscreen interface now supports Apple CarPlay, and the LT and Z71 models get an enhanced driver information display. 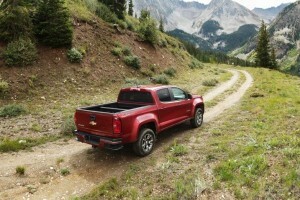 Midsize truck fans rejoiced when the new-generation Chevy Colorado arrived on the scene last year. Compared with older rivals in this class, it was more pleasant to drive, nicer on the inside and thriftier at the pump. Yet history may judge 2016 as an even more momentous year for midsize trucks because the 2016 Chevrolet Colorado is the first modern example to offer a diesel engine. It’s a pricey add-on, to be sure, but the diesel provides a highly desirable combination of performance and fuel economy. You might not be all that impressed when you scan the specs on the diesel. After all, we’re talking about a 2.8-liter four-cylinder that makes all of 181 horsepower. But the engine’s 369 pound-feet of torque tell the story here. That’s far more torque than you get with the gasoline V6, and not only can a diesel Chevy Colorado handle even bigger towing jobs, it’ll also feel stronger and smoother pulling your trailer up highway grades. In normal driving situations, the diesel has a more relaxed character than the Colorado’s gas engines and, thanks to the extra low-end grunt, the standard six-speed automatic transmission doesn’t need to change gears as often. For now, Chevrolet is offering the diesel to retail consumers only on crew cabs. The other notable update to the 2016 Colorado is the arrival of Apple CarPlay smartphone integration in trucks equipped with the available 8-inch MyLink touchscreen interface. This should make the Colorado that much more appealing for buyers who crave uninterrupted connectivity. It’s worth noting, however, that the full-size Silverado 1500 also gets Apple CarPlay for 2016, and there’s an argument to be made for making the stretch, especially if you’re considering the Colorado V6. After all, the V6 isn’t that much more efficient than the Silverado’s satisfying 5.3-liter V8, and the price difference may be less than you think. If you’re sold on the midsize-truck segment, you’ll naturally want to take a hard look at its reigning champ, the fully redesigned 2016 Toyota Tacoma. With its higher ground clearance and superior approach angle, the Tacoma is a real mountain goat compared to the more street-biased Colorado, and its technology offerings have improved notably this time around. The aged Nissan Frontier ranks a distant third in most categories, but it’s likely to be the most affordable option, and it remains a competent, if uninspiring, pick. If you’re planning to go diesel, it’s worth your time to look at the full-size Ram 1500, which offers a diesel V6 in a wide range of cab styles. Overall, though, the 2016 Chevrolet Colorado should please the vast majority of midsize truck buyers with its diverse collection of talents. The 2016 Chevrolet Colorado is a midsize pickup offered in two- and four-seat extended-cab and five-seat crew cab body styles. There are two bed lengths and four trim levels, ranging from no-nonsense Base and Work Truck models to the better-equipped LT and the top-of-the-line Z71. The entry-level model, known simply as Base, is offered only on the extended cab. Standard features include 16-inch steel wheels, automatic headlights, daytime running lights, air-conditioning, vinyl upholstery and floor covering, a four-way power driver seat with manual recline, front bucket seats, rear-seat delete, a tilt-only adjustable steering wheel, power windows, a rearview camera and a six-speaker AM/FM audio system with a 4.2-inch color display and USB and auxiliary audio inputs. The next step up is the Work Truck model, which is available in both extended-cab and crew cab body styles and adds fold-up rear jump seats (extended-cab models only), cloth upholstery, carpeting and floor mats. The major difference between the Base and Work Truck trims is the latter’s exclusive list of desirable options, including the WT Convenience package, which bundles an EZ-Lift tailgate, a driver-side convex “spotter” mirror for enhanced visibility, remote keyless entry, cruise control and a theft-deterrent system. The Work Truck Appearance package adds 16-inch alloy wheels, chrome beltline trim, power-adjustable side mirrors and additional body-color exterior trim (mirror housings, door handles, rear bumper). An audio system upgrade package includes a basic version of Chevrolet’s app-based MyLink system (operated via the 4.2-inch display), Bluetooth phone and audio connectivity, voice controls, Pandora Internet radio, OnStar telematics and 4G LTE WiFi hotspot connectivity. Stand-alone options include an automatic locking rear differential, a spray-on bedliner and a trailering package (V6 models only). Springing for the LT gets you most of the items in the WT Convenience and Work Truck Appearance packages (with the notable exception of the EZ-Lift tailgate), plus 17-inch alloy wheels, an overhead console, a tilt-and-telescoping adjustable leather-wrapped steering wheel, cruise control, illuminated visor mirrors, OnStar (with 4G LTE WiFi) and an upgraded version of the MyLink interface with an 8-inch touchscreen, Apple CarPlay smartphone integration, satellite radio, voice and steering wheel controls and four USB ports (two for the music interface and two for device charging). Options on LT models include the LT Convenience package, which adds foglights, a rear window defroster, the EZ-Lift tailgate, remote starting and a sliding rear window. The Luxury package (offered with or without chrome exterior accents) includes projector-style headlights, heated mirrors, chrome door handles and rear bumper, a four-way power front passenger seat, driver and front passenger power lumbar adjustment, heated front seats, automatic climate control and an auto-dimming rearview mirror. The available Safety package includes frontal collision and lane departure warning systems. The top-of-the-line Z71 trim level comes standard with the contents of the LT Convenience package and the functional upgrades from the Luxury package, and it adds distinctive LED daytime running lights, dark-tinted 17-inch alloy wheels and grille surround, all-terrain tires (instead of all-season tires), an off-road-oriented suspension, the locking rear differential, hill descent control, unique cloth/leatherette upholstery and other model-specific trim pieces. Offered exclusively on the Z71 is the Trail Boss package, which enhances the Colorado’s image and off-road ability with 17-inch black wheels, black badges, all-terrain tires, black step bars, off-road lights, an off-road “sport bar” and fender flares. The LT and Z71 offer the diesel engine (crew cabs only), a seven-speaker Bose premium audio system and a navigation system (an enhancement of the standard 8-inch MyLink interface). All V6-powered Colorados can be fitted with a dual-mode sport exhaust. Three engines are available on the 2016 Chevy Colorado. The entry-level engine is a 2.5-liter inline four-cylinder that puts out 200 hp and 191 lb-ft of torque. Matched to a six-speed manual transmission, which is standard on the two-wheel-drive Base and extended-cab WT models, it returns EPA fuel economy estimates of 22 mpg combined(19 city/26 highway). With the available six-speed automatic, the numbers are 22 mpg combined (20/27) with two-wheel drive and 21 mpg combined (19/25) with four-wheel drive. Properly equipped, four-cylinder models can tow up to 3,500 pounds. The available 3.6-liter V6 is a major upgrade over the four-cylinder with its 305 hp and 269 lb-ft. It comes mated to the six-speed automatic. EPA estimates for two-wheel-drive models are 21 mpg combined (18/26), and with four-wheel drive you’re looking at 20 mpg combined (17/24). These are good numbers, but we were unable to match the combined mpg rating in Edmunds’ 12-month Chevrolet Colorado long-term test. Properly equipped V6-powered models have a maximum towing capacity of 7,000 pounds. The LT and Z71 crew cab configurations offer an optional turbocharged 2.8-liter four-cylinder diesel engine with 181 hp and an impressive 369 lb-ft of torque. A six-speed automatic is standard, as is a more deluxe trailering package that includes a driver-selectable exhaust brake and an integrated trailer brake controller (not available with the V6). You have a choice between 2WD and 4WD. When properly equipped, the diesel Chevy Colorado has a tow rating of 7,700 pounds. Expect the diesel to return significantly better fuel mileage than the V6 whether there’s a trailer hitched to the back or not. In Edmunds performance testing, a V6-equipped 4WD Colorado crew cab short bed went from zero to 60 mph in a quick 7.5 seconds, beating a 2016 Tacoma 4WD V6 by 0.7 second. Standard safety features on the 2016 Chevrolet Colorado include antilock disc brakes, stability and traction control, trailer sway control, front seat side impact airbags, full-length side curtain airbags and a rearview camera. The OnStar telematics system (standard on upper trims) provides emergency crash notification, stolen vehicle notification and remote locking and unlocking services. Note that the Safety package, which includes forward collision and lane departure warning systems, is offered only on the LT trim level. During Edmunds testing, a Colorado V6 Z71 crew cab short bed came to a stop from 60 mph in 129 feet, while a Colorado V6 LT 4WD crew cab long bed stopped in just 123 feet. Both results are a few feet better than comparable Tacoma models we’ve tested, likely due to the GM trucks’ slightly grippier tires. In government crash testing, the Chevy Colorado extended cab earned an overall rating of four out of five stars, with four stars for overall frontal crash protection and a full five stars for side-impact safety. The Insurance Institute for Highway Safety gave the Colorado crew cab its highest possible rating of “Good” in its moderate-overlap frontal-offset crash test, the only test conducted as of this writing. The 2016 Chevrolet Colorado’s readouts and controls are generally well-placed and intuitive, though the design of the gauges is exceptionally generic-looking. The available MyLink infotainment system is relatively simple to use, and we like the extra capabilities of the voice command system and built-in Apple CarPlay compatibility. The touchscreen can sometimes be slow to respond to inputs, however, or require a reset before it responds at all. Seat comfort is excellent up front, even on long drives, and if you’re on the tall side, you’ll find headroom and legroom more plentiful than in the Tacoma. The crew cab’s rear seat also offers a few more inches of legroom compared to class rivals and is pretty comfortable for two normal-sized adults, though full-size crew cabs are still the way to go if backseat space is a top priority. As with most extended-cab models, the rear jump seats in the Colorado’s version are no place you’d want to put an adult for more than a short jaunt. Both body styles offer storage space under those rear seats for valuable tools or gear you’d rather not leave unprotected in the bed. For shoppers interested in the extended cab, Chevrolet has integrated a feature where the rear headrest doubles as an extension to the rear seat bottom, allowing for the installation of a child seat. On the road, the 2016 Chevrolet Colorado feels polished and confident. That’s not to say its ride is luxury-sedan smooth &mdash; this is still a pickup, after all &mdash; but it has a less truckish quality than you might expect. Handling feels secure, with relatively little body lean when you’re driving around turns. On the flip side, the Colorado’s modest ground clearance combines with the low-hanging front airdam (which is meant to improve aerodynamics and therefore fuel economy at highway speeds) to hamper the truck’s off-road ability. You’ll certainly want to remove the airdam if you’re planning on doing any serious four-wheeling. The Colorado’s entry-level, gasoline-fueled 2.5-liter four-cylinder engine is pretty underwhelming unless you’re just looking for a cheap, basic truck (or you want a manual transmission). Fitted with the available V6 engine, however, the Colorado has plenty of oomph and can tow your typical trailer full of dirt bikes or ATVs without breaking a sweat. The engine sounds coarse during hard acceleration, though, and the six-speed automatic transmission can be a bit slow to downshift. The potent yet efficient turbodiesel four-cylinder is a compelling alternative, as there’s plenty of torque available at low engine speeds, meaning the transmission doesn’t have to downshift as often. The diesel Colorado is extraordinarily quiet, too.